It sometimes happens that a man at home moves about the house, goes through familiar motions, everyday motions, his expression unguarded, and, suddenly raising his eyes, he notices that the curtains have not been drawn and that people are watching him from outside. 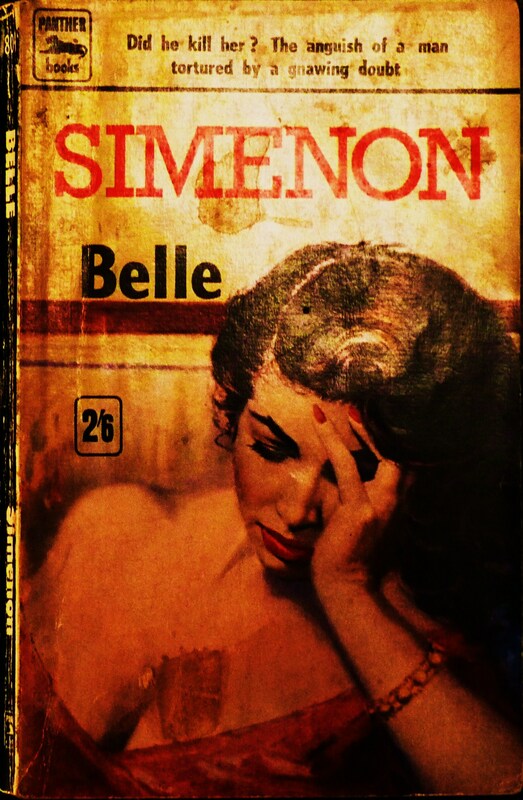 The opening of Belle describes a state of being characteristic of a great number of Simenon protagonists. It is a state of extreme self-consciousness, such that, even when is alone, the character behaves as if being observed, as though in expectation that he[*] will later be asked to account for his actions. Such characters exist in a condition of inauthenticity – they are not being, but are acting the role of themselves; or perhaps more accurately they are acting the role they have created for themselves or which others (wives, parents, colleagues) have assigned to them. Could he foresee [. . .] that that evening would later be studied under a magnifying glass, that he would almost literally be made to relive it under the magnifying glass, like an insect. The role that Spencer Ashby has created for himself is that of respectable citizen in a small Connecticut town. His wife, Christine, is a stalwart of various committees, the church and the local bridge club. Theirs is a marriage of convenience and companionship, entered into as a matter of social convention rather than passion. The murder of Belle, however, strips away the veneer of respectability. As the police discount all other suspects, suspicion gradually falls on Ashby. Of course, nothing is said. Instead, he asked to take a few days’ leave from school until everything blows over; in the local post office, a handshake is refused; his neighbour installs a burglar alarm; a large ‘M’ is painted on the side of his house; while in church he has the impression that ‘there was a void around him’. Ashby is unsure, however, whether it is the community that is excluding him or if it is he ‘who no longer felt wholeheartedly among the others.’ The murder of Belle reveals him as the outsider which his respectable marriage and career have been erected to disguise. They were not accusing him. They were not throwing stones at him. [. . .] Had they perhaps only tolerated him all these years? This wasn’t his village. This wasn’t his church. None of the families here knew his family and there were none of his forebears in the cemetery. Although Ashby is the central consciousness of the novel – we see the world through his eyes – Simenon is canny enough to maintain an element of doubt as to whether he has killed Belle. And when the police question him for a second time, this time with a psychiatrist present, we learn that Ashby’s father was an erratic drunk who shot himself in the head. There is a side to Ashby’s character that has previously been concealed and under the gathering pressure of the investigation, he reacts as his father would – by seeking oblivion in a destructive alcoholic binge. It’s a regular Simenon trope – that no one can fully escape their origins, whether social or psychological. In the world of Simenon, sooner or later everyone, with a little prodding, reverts to type. Belle represents Simenon at close to his best. It is meticulous in its dissection of Ashby’s character; the minimal narrative unfolds with consummate skill, and the portrait of a small town community too buttoned up to do anything other than subtlety shun a suspected murderer is flawlessly observed. La mort de Belle first published in 1952. Panther edition published 1958. Translated by Louise Varèse. [*]These characters are invariably male.